I first learned about Roz Savage, a British adventurer and environmentalist, in 2010. What got my attention about Roz is how her life changed when she sat down to write two versions of her obituary — the one she wanted and the one she had. This simple but profound exercise helped her to realize that she was on the wrong track. As a result, Roz took dramatic measures to reorder her life in order to ensure that she lived up to the obituary she wanted. Her convictions about the environment motivated her to raise awareness about pollution in the world’s oceans, especially the plastic products that harm so much of marine life. So, Roz set out to row across the Atlantic Ocean and later the Pacific Ocean — the first woman to accomplish these feats solo. As of this writing, Roz is rowing across the Indian Ocean in her twenty-three foot rowboat. Rowing across an ocean is an amazing accomplishment. On her three-thousand mile Atlantic crossing from the Canaries to Antigua, Roz encountered all sorts of challenges. In addition to the physical and mental fatigue of the journey, the following are just a few of the challenges she had to deal with. Day 12 | First oar breaks. Day 15 | Second oar breaks. Day 20 | Camping stove stops working. Day 37 | Navigations instruments die. Day 38 | Third oar breaks. Day 41 | Stereo stops working. Day 48 | Fourth and last oar breaks. Roz patches her oars and carries on. Day 79 | Satellite phone breaks leaving Roz totally isolated. Day 103 | Roz rows into English Harbour, Antigua, and into the history books. 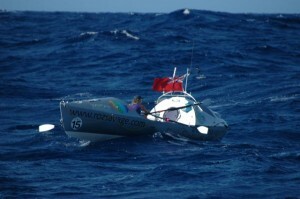 What makes a person like Roz do something like row alone across three oceans? In a word — convictions. When convictions become more important than comfort, ordinary people can do extraordinary things. Whether or not you share Roz’s concerns about the environment, she believes that our oceans are in danger because of the current rate of pollution. And she believes it enough to do something about it. In a recent blog post, Roz quoted a British politician who said that doing something is a bit better than being someone. I agree. Or in the words of my late grandfather, “Don’t just be good, be good for something!” People like Roz make it hard for the rest of us to remain passive about our convictions. Roz’s determination should cause us to consider what we believe and whether we believe it enough to forsake comfort in order to make a difference. That’s what going beyond is all about. I admire Roz Savage’s determination. Thank you, Roz, for reminding us that the only way to stop drifting is to start rowing!